The Animal Health Trust (AHT) is advising horse owners to be extra vigilant following recent outbreaks of equine influenza (EI) across parts of the UK and northern Europe in both vaccinated and unvaccinated horses. The AHT is encouraging horse owners to be aware of the clinical signs of EI which include harsh, dry coughing, nasal discharge, lethargy and an increase in temperature (>38.5°c). These clinical signs may be mild and not all horses will present with all of these. If a horse owner is concerned they should consult their vet as soon as possible who can take a swab and blood sample and send it for testing, free of laboratory charges, to the Animal Health Trust’s equine influenza surveillance scheme which is funded by the Horserace Betting Levy Board. Equine flu is a highly contagious respiratory disease caused by the equine influenza virus. The virus is spread from horse to horse via respiratory droplets by direct contact as well as coughing and via indirect contact where appropriate biosecurity is not being followed. The virus relies on this transmission to new horses to survive and one of the most notable features of flu is the very quick spread of clinical signs in groups of horses and its ability to spread large distances in the air. Therefore horse owners are encouraged to consider their existing biosecurity arrangements in their yard. This includes ensuring they practice good general hygiene and isolating any horses showing flu-like signs. 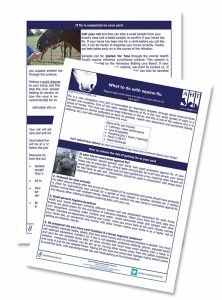 The AHT is also recommending horse owners re-vaccinate their horse if their vaccination was carried out over 6 months ago, in order to maximise the chance of having protective immunity.